Within a couple of hours after purchasing a product license, the customer will receive two e-mail messages: the first one confirming the payment and the second one containing an unlock key, which should be used to register the product. If you will not receive your unlock key within 24 hours, please check your spam box and if the unlock key is not in the spam box contact our support team: support@flexense.com. If the computer where SyncBreeze Server is installed on is connected to the Internet, open the SyncBreeze client GUI application, connect to the SyncBreeze server, click on the 'Register' button located in the top-right corner of the window, enter your name or your company name, enter the received unlock key and press the 'Register' button. 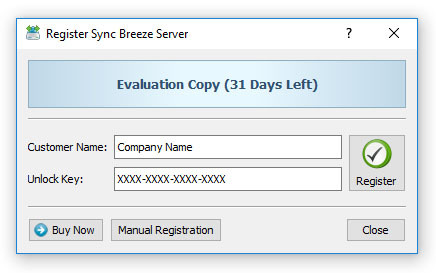 If the computer is not connected to the Internet, press the 'Manual Registration' button, export the product ID file and send the product ID file to register@syncbreeze.com as an attachment. Within a couple of hours, you will receive an unlock file, which should be imported in order to finish the registration procedure.